Home > North America > United States > Not Meant To Live Like This. The book! Sunday 26 August 2012 sees the launch of the much-anticipated book “Not Meant To Live Like This: Weathering the storm of our lives in New Orleans”. 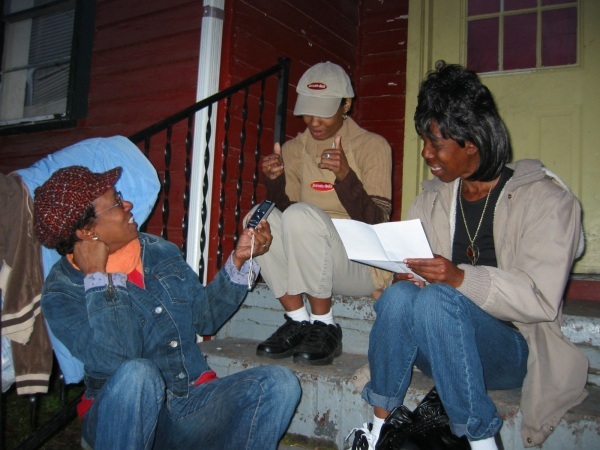 Born and raised in poverty in the Irish Channel, the 7th Ward and Central City neighborhoods of New Orleans, the inspiring co-authors of “Not Meant to Live Like This” share their experiences and speak candidly about their lives before and after Katrina. In the months following Hurricane Katrina’s devastation of the Gulf Coast in 2005, ATD Fourth World Volunteer Corps members based in New Orleans traveled the southern United States to reconnect with displaced members and re-establish a network of support. While visiting the Collins family in Arkansas, long-term volunteers Maria Victoire and Corrinna Bain were given the idea for the book by Eula Collins. Maria and other volunteers then traveled the length and breath of Texas, Georgia, Arkansas, Mississippi, Arizona and Kentucky, tracing displaced families and recording their testimonies. Following this project, Loyola University hosted a seminar of the same title in 2009 where wider issues of extreme poverty were discussed. The Fourth World Movement’s presence in New Orleans gave its members a unique window into the devastation caused by Hurricane Katrina in 2005. Thousands died and whole sections of New Orleans were flooded and destroyed. Those families who had survived for years under the weight of persistent poverty were often the last to be evacuated. Many of them were the families with whom the Fourth World had partnered for years, and many have not returned to the city. The overreaching goal of the book “Not Meant To Live Like This”, is to bring together the voices of those living in persistent poverty with academic research on poverty eradication. This book adds a context and perspective to research in sociology, anthropology, urban studies, history, social work and a variety of other social sciences. The success of any society rests in its ability to understand and empathize with those who are forced to do more with less, and an understanding of how they build and sustain a community under such circumstances can strengthen society as a whole. The book is priced at $31.95 and the book sales support this project and other projects with Young Leaders and children in New Orleans. “Not Meant To Live Like This: Weathering the storm of our lives in New Orleans” will be available for sale from August 26 2012 at our book launch and tour events, at participating book stores and online.